A rope access operator works in hard-to-reach areas without the benefit of a scaffold or a work platform. The key word for these highly-trained specialists is safety. Rope access basically involves wearing a harness and using techniques developed from rock climbing and caving to get somewhere high up and do a job. The three main types of work are: structures, such as buildings and bridges; geotechnical, such as cliffs and steep slopes; offshore, such as oil/gas infrastructure. Rope access operators often develop areas of expertise and will work almost exclusively in that area. The types of tasks that rope access operators perform can include: painting and cleaning tall buildings; maintaining and repairing structures and performing inspections; working on wind turbines; cleaning windows and performing routine maintenance; repairing aircraft warning lights; installing and maintaining banners or signs; installing or repairing meshing designed to prevent rocks from falling. Why did you choose this job? I was looking for a job for a long time and a friend who was a rope access operator suggested I try it. What training did you undergo? I undertook a five-day training course, which involved practical work and theory. I passed the verbal exam and qualified as a Level One: Rope Access Operator. Is there a type of personality best suited to this work? You must be fit and brave and have a head for heights. You must be very trusting, as you need to trust your supervisor to rig the ropes properly. Ladies can do this job, but it is hard work. What do you like the most about your job? I like to be up high, looking down on the city. It makes me feel proud. This job can offer me a future. Care to share your future goals? I need to complete 500 hours of rope work and then I can do my Level Two training. One day I want to buy a house and a car. What advice would you give to someone starting out? Many people don’t have jobs, especially women, but that doesn’t mean there aren’t jobs you can do. Women can do men’s jobs; you just have to give it a go and try your hand at everything. 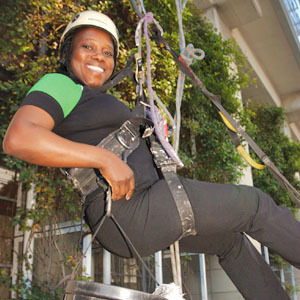 There are several training options for someone who would like to become a rope access operator. There are three different levels of training. The first level is usually a 40-hour course that is completed over five days. After this first level has been completed, the student is certified as a rope access operator. The second level of training also consists of a 40-hour course, but the student also needs 500 hours of training experience before they are eligible to enroll in the second level. The third and final level of training requires that the operator have 1 000-2 000 hours of training experience. After passing the third level, the person is qualified to supervise other rope access operators. Make sure that the training institution is accredited.